Entry to the restaurant is down a tight passage past The Witchery and just up from the Hub: this narrow route adds to the mystery and heightens your expectations The atmosphere outside with lots of architectural decoration and foliage is carried through into the interior. This is an indulgent and decorative experience. The introduction was polite and the entry down the stairs fun. The interior has historic importance and basically consists of an almost square room lit from tall old windows facing due south. The place is lit throughout by decorative candles sometimes held aloft by cherubs, the restaurant key motif. The palette is dark, mostly stone with areas of gold, gilt and dark wood. The huge tapestry on the wall softens the acoustics well. well-presented, delicious, fresh: my wife had salmon on cabbage with a pleasant chilli sauce. I had gazpacho soup with the right temperature and texture, fine. Beef: tasty, ‘top marks’ according to my wife. Sea Bass: delicate, moist, but with far too many peas. Plates taken away and cleared with good timing. Green salad: lovely mix, but stalks left on and rocket rather too spicy. Large Chips: fine, but a shame such a high class restaurant could not provide new potatoes even upon request. The goats cheese baked in filo pastry with armagnac, prunes and green salad sounded highly tempting: sadly we were already full! The Wine List is a veritable tome, a weighty book of world wine: very impressive and integral in bringing numerous wine awards to the restaurant. The wine waiters were prompt and knowledgeable and responded well to the challenge of providing my wife with a ‘full-bodied red wine’ maintaining it ‘should go well with the beef’ which was either superb integration of food and drinks service or quick thinking on the part of the wine waiter: either way, very impressive. Glasses were good quality and my wife’s G&T came with lime & ice: slightly presumptuous, but in this case successful. The salt and pepper looked out of place sadly, seeming more suited to a pizza restaurant. The plates however were elegant white with the Witchery’s W logo to the top: given this design it is imperative that both the liner and the plate correspond and that the W sits at twelve o’clock. Mine read five-to-ten. Service was generally prompt, and the view to the south is calming. The temperature was pleasant but became too warm later in the evening as the room filled up. The menu was simple, easy to read. Descriptions of the food were slightly complex for non-French speakers. The lack of music and views of the kitchen a definite plus. We really enjoyed our meal at the Secret Garden due to the mix of sumptous historic setting and excellent food. Well worth a visit. The Secret Garden won The Sunday Times Regeneration Award. 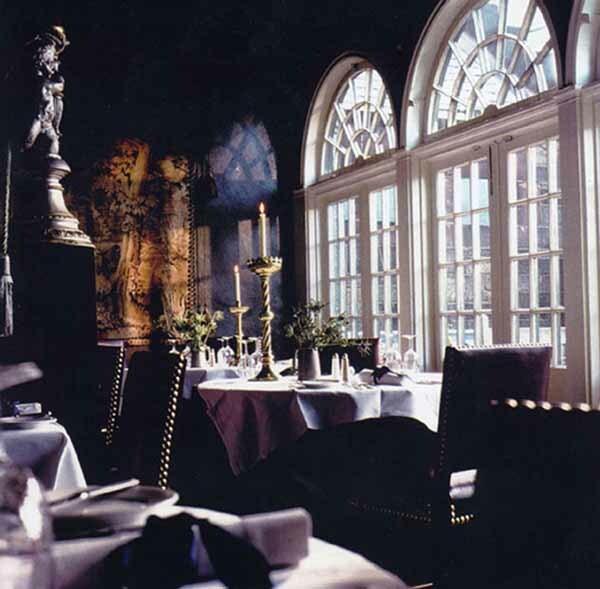 The Secret Garden was named the Domecq La Ina ‘Most Civilized Dining room in Scotland’. Edinburgh’s famous The Witchery by the Castle has scooped yet another honour, just days after celebrating it’s 25th Anniversary on Halloween this year. The Witchery has been named as the ‘Best City Bolthole’ in the prestigious Sunday Times Travel Magazine Awards. This latest award ranked the Witchery alongside other category winners that included world-famous names such as Raffles in Singapore, the Burj Al Arab in Dubai and the George V hotel in Paris. gates of Edinburgh Castle, where guests find fantastically gothic decor, opulently draped beds, masses of antiques and roll-top baths large enough for two when they check into their suite. the exceptionally dramatic Witchery and the charmingly gothic Secret Garden, the restaurant that Andrew Lloyd-Webber described as the “prettiest restaurant ever!” Currently celebrating its 25th anniversary the Witchery is Scotland’s most famous restaurant, much loved by its fiercely loyal regulars as well as by its legendary celebrity following. This is the latest award in a busy silver anniversary month for the Witchery Restaurant that has seen it receive coveted 5-star status from VisitScotland and also seen owner James Thomson receive the highest tourism Oscar, the Silver Thistle, from Scotland’s First Minister Jack McConnell at a ceremony in Edinburgh. Thomson has just celebrated the Witchery Edinburgh’s Silver Anniversary in decadent style by hosting a lavish dinner for 300 of the Witchery’s clients, staff and celebrity supporters, that raised sufficient funds to enable charity Sight Savers International restore the sight to over 3,000 children in Bangladesh. Winners of the Sunday Times Travel Awards were chosen by over 6,000 readers and a team of specialist travel writers and experts. The Awards were presented by Royal correspondent Jennie Bond The rate for 2004 is £250 per suite per night, inclusive of VAT, continental breakfast and a complimentary bottle of Pol Roger Champagne. The Witchery by the Castle was established by restaurateur, hotelier and entrepreneur James Thomson in 1979 with a staff of three. Now a team of over 250 work with him in his collection of unique properties and his first year’s turnover is achieved daily. In addition to the Witchery by the Castle, its famous suites and the Secret Garden, James also owns and runs Edinburgh’s first and finest rooftop restaurant the Tower. He has recently bought and restored the 17th century Prestonfield which has quickly become Scotland’s latest 5-star hotel, has been named as Scotland’s Most Romantic Hotel and recently by the AA as their Hotel of the Year in Scotland. Prestonfield is the location for his latest destination restaurant – Rhubarb, glamorous and the most opulent to date.